Welcome to Key Brands International Ltd. Wholesaler and distributor of food, beverage, personal hygiene and non food items throughout the world to niche industry sectors. Established in 2009, we have become one of the leading suppliers of food and beverages across a range of niche market sectors including the airline industry, military, remote site operations, ship chandling and hospitality. We are able to provide: • Food Service – Branded and Tertiary including dietary and Ethnic specific such as Gluten Free, Vegan, Halal and Cosher. • Grocery – Branded and Tertiary including dietary and Ethnic specific such as Gluten Free, Vegan, Halal and Kosher. • Beverages – Alcoholic and Non Alcoholic from canned drinks to bottles of wine through to bag in box dispensing. • Personal Hygiene – Men's and women's hygiene associated products. • Non Food – This embodies laundry, kitchen and cleaning and all catering hardware. Our success has come from our customer focused approach. Along the entire supply chain, we use our knowledge and experience to develop practical solutions to clients’ requirements. We act as a trustworthy partner, taking over our clients’ tasks and working actively with them to achieve their ambitions. We purchase products direct. This gives protection against counterfeit and potentially harmful products. Our product range is continually increasing giving our customers increased choice. 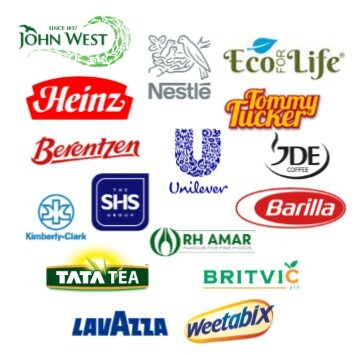 We supply worldwide brands, Dietary Specific and Ethnic Ranges. Due to the majority of our contracts being fixed we can maintain 6 months secure pricing. There may be products that you wish us to source. Contact one of our experienced teams and they will contact you to discuss your exact requirements. If our buying prices are reduced we will pass this saving on to you. Our team are dedicated to providing the highest level of service at all times. Headed up by Michael Shore the team have over 20 years of experience in import and export. For all logistics enquiries please contact Lydia Burt. We provide the highest quality goods at the right prices. We offer a bespoke solution, so please contact us to discuss your requirements.